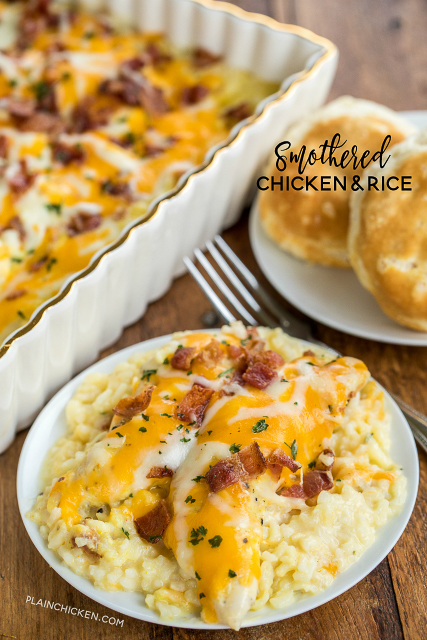 Smothered Chicken and Rice recipe - seriously delicious! Everyone cleaned their plate and asked for seconds! That never happens at our house!!! 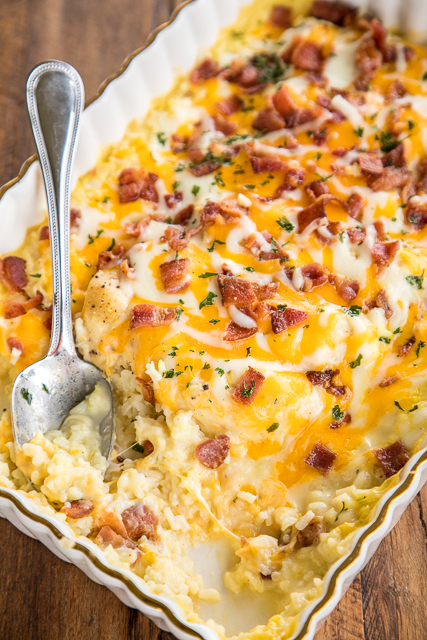 Chicken and rice baked in cream of chicken soup, milk, cheddar, mozzarella and bacon. Ready to bake in a snap and on the table in 30 minutes. We make this at least once a month!! SO GOOD!! 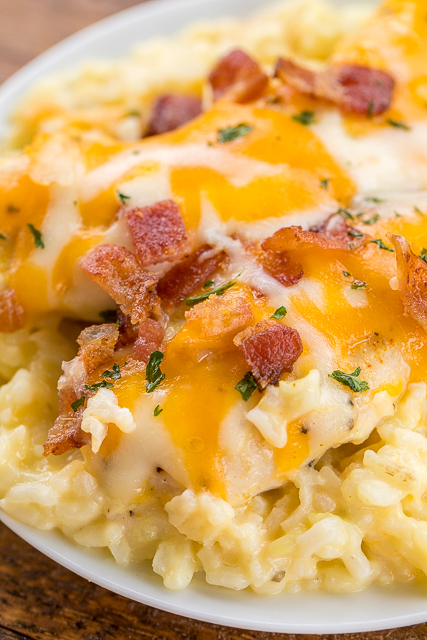 This Smothered Chicken and Rice was a HUGE hit in our house. It was so good that we ate this for dinner two nights in a row!! 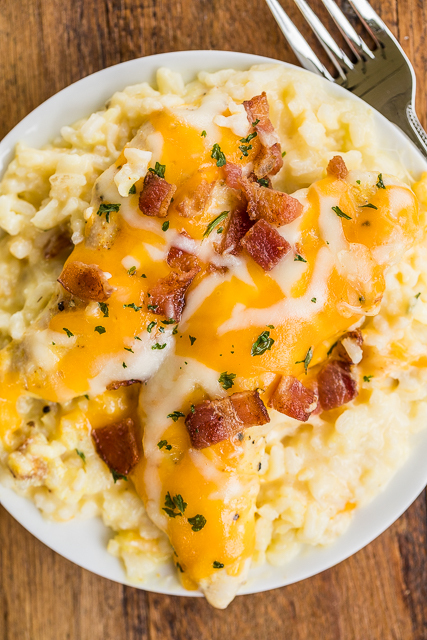 Chicken and Rice smothered in cream of chicken soup, milk, cheddar, mozzarella and BACON - how could this not be good?!?!?! This was super easy to make. It literally took 5 minutes to assemble and it was ready for the oven. Whip up some green beans and biscuits while the Smothered Chicken and Rice is baking and dinner will be on the table in about 30 minutes. You seriously can't beat that! This casserole uses 2 cups of cooked rice. You can make the rice ahead of time and refrigerate it until you are ready to bake this casserole. Use your favorite rice - minute rice, long-grain rice, brown rice, a pre-made bag of rice. Just make sure to use one that you and your family enjoy!! This has quickly become a favorite in our house. 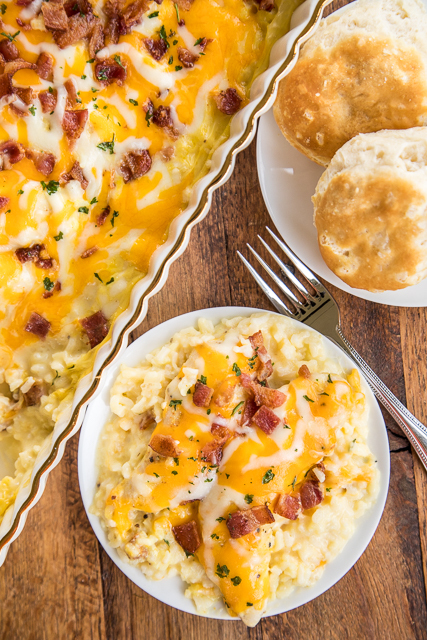 It has already been requested for dinner again this weekend! Can't wait!! Preheat oven to 375ºF. Lightly spray a 9x13-inch pan with cooking spray. Spread cooked rice in bottom of prepared pan. Top with chicken tenders. Sprinkle chicken with seasoned salt. Mix together cream of chicken soup and milk. Pour over chicken. Bake uncovered for 20 minutes. Remove from oven and top chicken with shredded cheeses. 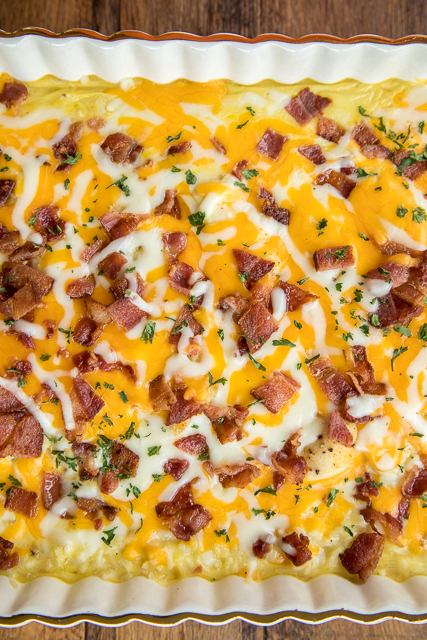 Sprinkle cooked bacon on top of cheese. Return to oven and bake an additional 5 to 10 minutes. Could I use quinoa instead of rice??? I think quinoa would be a great swap for the rice! I like to add some "riced" cauliflower to the rice just to include some veggies. Did you use the quinoa, and can it be cooked quinoa? I was just sitting here thinking what to make for my picky kids as they hardly eat anything without cheese..I got excited when I realized I have all these ingredients in my kitchen and deep freezer so no trips to the store! Yay gonna give it a try tonight. Thanks for posting! I’ll circle back and tell you if it makes it in their bellies or the wall LOL! can you cut chicken breasts into tenders? Do you cook the chicken first and then bake? Or does it cook fully while baking? Don't want to put raw meat on top of the rice and get anyone sick. Thank you! Do NOT cook the chicken beforehand - it bakes with the rice. I added some carrots, celery, and diced onion to layer over my chicken, I'll let you know how it turns out. My family loves "Pot Pie" style dishes, and it's a sneaky way to get in a few veggies! Wondering if this would work with breaded raw chicken tenders? Wondering if this would work with frozen breaded chicken tenders?